Dr. Seuss is the pen name of Theodor Seuss Geisel (1904–1991), who began drawing fantastic animal cartoons while he was still a child. (His father ran the local zoo.) An art teacher told him that he would never learn to draw, and twenty-seven publishers rejected his first children’s book, And to Think That I Saw It on Mulberry Street (1937). Even so, Dr. Seuss went on to write and illustrate more than forty children’s classics, full of nonsense rhymes, wacky creatures, and his special brand of wisdom. Could a Plain Belly get in the game…? Not at all. 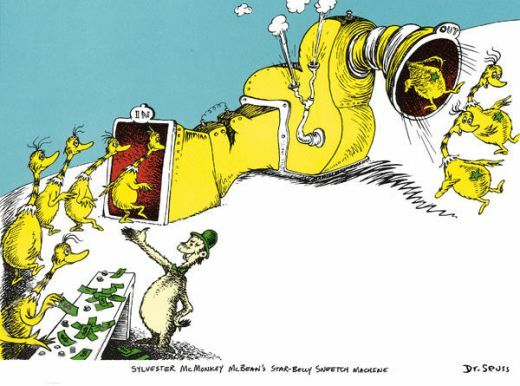 “My name is Sylvester McMonkey McBean. And I’ve heard of your troubles. I’ve heard you’re unhappy. But I can fix that. I’m the Fix-it-Up Chappie. I’ve come here to help you. I have what you need. And he said, “You want stars like a Star-Belly Sneetch…? Then they yelled at the ones who had stars at the start. “We’re exactly like you! You can’t tell us apart. We’re all just the same, now, you snooty old smarties! “Good grief!” groaned the ones who had stars at the first. “We’re still the best Sneetches and they are the worst. And he said, “Things are not quite as bad as you think. So you don’t know who’s who. That is perfectly true. But come with me, friends. Do you know what I’ll do? “Belly stars are no longer in style,” said McBean. What you need is a trip through my Star-Off Machine. “We know who is who! Now there isn’t a doubt. Or which one was what one…or what one was who.